He is just beautiful; I cannot thank you enough for sending him over. Every one he meets loves him. I have put a web address below of a day care centre in which Jasper used to go to when he was smaller – the site has a video link where you can see jasper playing with the other dogs. 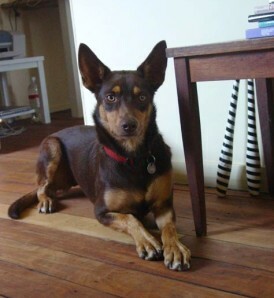 He continues to go to day care but another one with more Kelpies and larger dogs, which he absolutely loves. I will write again soon and attach some photos of Jasper . Hi Mary, How are you? Just a short note on how Peggy is going... She is brilliant!! She has fitted in perfectly as part of the family and she is gorgeous, just a lovely, lovely dog. We all adore her. Everyone comments on her and how well behaved she is and how lovely she is. She has lovely manners, and a very kind nature. A few people have stopped me in the street and asked where did I get her, and a couple of people have taken your name down. We sorted the nipping out very quickly after I spoke with you last - lots of raw hide chews and toys on hand. Also Tilly has become more confident with her and I try to do some training together with Peg and the girls, which works well. Toilet training was going really well to start with, but then it wasn't, and I took her to the vet and it turned out she had a urinary tract infection, but all sorted now and toilet training is back on track, with only the occasional accident inside. Peggy is going really well on the lead. She did pull a lot to start with & still does sometimes & sometimes she trots along very nicely next to me with a loose lead, varies from day to day, but getting better all the time. I have recently been using a a check chain and that works really well, and she hardly pulls at all, just needs a gentle reminder now and again. She learnt 'STOP' very quickly and when we walk if I say stop now she does it nearly every time. Sitting beautifully too. The 'COME' command needs more work - although now I just turn it into a game if I think she isn't going to come - she gets that look, and just doesn't come to me, but now I say come and run in the opposite direction and she comes most times with that one. I know it will take a while. She is so intelligent! and sometimes so naughty! (and very funny) - knows she shouldn't get one of Tilly's toys, (or our shoes) but quickly darts in, grabs it and legs it off round the garden... a big game. The down-stay is FABULOUS! wow, Peg has responded really well to that, she goes into a down-stay very easily now, and works wonders for times like when she is over excited and carrying on at the guinea pig or when we have friends with little children visiting etc and she gets too excited and all jumpy. She also ties up so well, and is very relaxed in lots of different situations. I just love her to bits, she is fabulous, a joy to train and I thank you so much. I am really enjoying her, we all are, she is gorgeous. Thank you so much for such a lovely dog. Attached are a couple of photos of Peggy - she has one ear up and one ear down at the moment! I hope you are well, I thought you may like to see some recent photos of Peggy & to let you know how she is going - she is going extremely well, I couldn't be happier. We've had a private dog trainer around a couple of times - as I can't get into the obedience training until October as all booked out. Peg comes every time I call her now - and once she started to do that, training has been so much easier. Peg loves the beach! We try to go down a few mornings before school every week and at the weekend. She is so good - it is such a delight to have a dog that plays so beautifully and gently with other dogs, - then comes when called! love her. Also, she is absolutely loving doing tricks, like jumping through hula hoops and our arms, (not too high off the ground though yet) When we pick up the hula hoop, she comes running, all excited! & I have taught her to jump 'in' the shell pool, then 'out' and now she does it even if there is water in - We do a little obstacle course around the garden. I am going to set up the kids old play tunnel & some broom handles this weekend - & extend the makeshift obstacle course! the girls really enjoy doing this with Peg as well. She responds really well to the girls now too, and even little Tilly - who just copies exactly what we say, so that's probably why! Heeling has probably been the biggest challenge, but she really respects me now and training is going so well, I couldn't be happier. I find if she has time off the lead first for a good run, then I do some training with her - on and off the lead, she responds well. She is brilliant off the lead with quick turns too, keeping at heel, she pays a lot more attention now. Obviously she still gets really excited and distracted but if I need her to listen, she will now, like coming straight back - even if she is playing with several other dogs on the beach. July 2010: She is going so well now. She's 16 months old now. At 12 months she went a bit (a lot!) backwards with training - barking and carrying on and stopped coming back! This lasted for a good few weeks. But then, turned around so well - and now she is as she was before again, actually - heaps better. so I guess it was just a stage - but I was also ill for a while with flu & she didn't get her regular exercise for a couple of weeks, I know this added to the problem in a big way. I got some excellent advice from a man called Eric Tighe who has the working sheep dog show http://www.workingsheepdogshow.com/ and he does beginners/intermediate/coaching sheep dog trialling and general obedience and I hope to do that with Peg soon, when there is a space - (when I have free weekend) he also does private lessons, so thats good. He's only 2 hours away from here, so I can't wait to get the time to do that!! She is so good and fun and happy and great to have around. I take her everywhere and she is so easy now, even at the rugby, (my husband plays) where there is heaps going on, she just waits, runs around, lies next to me. Everyone comments on (not only how gorgeous she is!) but also how calm she is for her age. 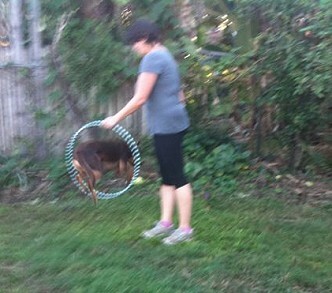 Attached a few photos - one lovely one of her in my studio & some terrible ones (I will get some better ones) of her jumping through a hoop and one with Tilly. I really want to get some good shots of her jumping! I need to get the family helping with photos. I tried flyball for a while - she loves the jumping & easily the fastest, but not that interested in the ball - I know I can teach her with the ball, and we do play with the ball at home, but I'm not that into it really. I prefer just doing tricks and jumps and tunnels at home and at the beach. Really I just wanted to tell you she's perfect. Hi Stephen and Mary, I thought I’d send you a quick email to let you know how Jarrah’s going. The drive home from your place was quite uneventful (which is a good thing) apart from Jarrah having a little spew in his crate before we reached Bathurst. He was very quiet and well behaved though. That evening my dad came down from Sydney to meet him but he was asleep all afternoon and all night. It must have all been a bit much for him. 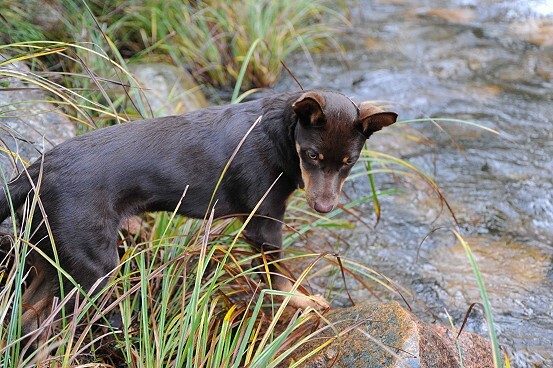 The first few days were fairly hard for Anne and myself as we were a bit paranoid about Jarrah doing a wee or poo inside or, even worse, eating something that might harm him, especially in the garden. After a week we began to relax a bit more as we got used to having him around and we learnt when he needed to go to the toilet. It’s been a bit over a month now and it feels like we’ve had him for a year already and not in a bad way. 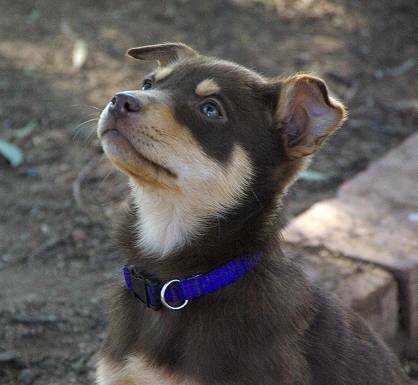 We reckon he’s the most awesome little pup. He’s been extremely well behaved, apart from the odd little mistake here and there, and is really smart. He’s learnt lots of tricks like sit, drop, stay, roll over, etc, very quickly and is just beginning to get comfortable with the water. He’s discovering (and loving) all the rock pools at the beach and is becoming less scared of the waves washing up the beach every day. We’ve been taking him down to the beach for a walk every morning and he’s been meeting lots of dogs and people and really learning to behave well with them. We’ve done 4 weeks of puppy pre-school and taken him to one basic lesson at a local dog obedience club which he’s really loved. He’s just so friendly to everyone and a lot of people comment about how good looking he is. My brother’s a vet and he said that he is really amazed and impressed by how well behaved he is for a 4 month old pup which I think has a lot to do with how you guys brought him up. 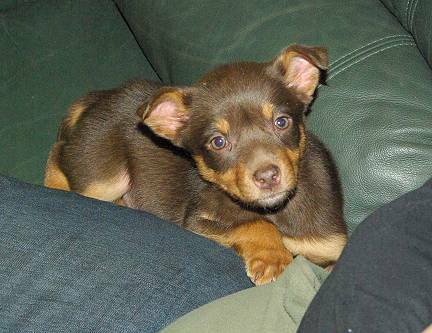 I’ve attached a couple of pictures of him from the weekend where we took him down to Wagga to visit my brother. You can see him standing on a rock in one of the pics, next to a river which he was mesmerised by for half an hour. If it wasn’t so cold I think he would have jumped in. Hi Mary and Stephen, I apologise for not sending the DVD as promised but we can’t seem to get it to save to disk. We have tried everything! Here is a recent picture of Eleanor (on right) and Bomber. They go absolutely crazy together but it has settled her down a lot as well. 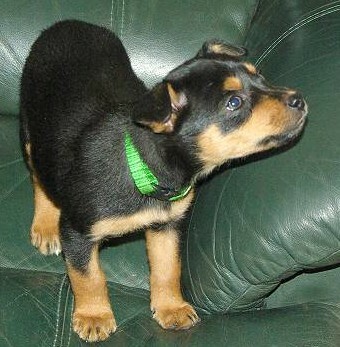 She is coming along nicely and learnt a few new tricks ( to give ten and to speak on command). Consistently she impresses me with her intelligence and she is showing great signs towards being an extremely loyal dog. 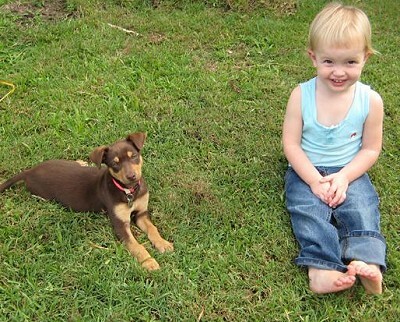 I am hoping to train her (with the help of Nathan’s cousin) to work sheep and perhaps cattle. I will also try agility when she matures more as her ability to maneuver is amazing and she loves to please, to the point she is extremely cheeky. A few weeks ago she finally got all the way in the ocean. Now! We can’t keep her out. She swims that much that I worry she will drown through exhaustion. If we are in the water then so is she. Poor bomber stands on the shore waiting patiently or gives up and makes himself comfy on our towels. Someone has to hold the fort. Other then that, the pen and kennel has been completed and ready to go. They are both happy to be put away. 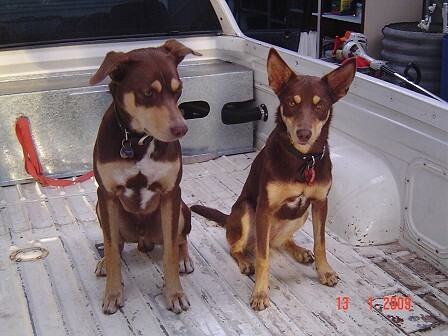 They have been sleeping in there at night as I have had problems with them barking at the kangaroos. We have hundreds of them down our way and with the reticulated paddocks I seem to have ¾ of the population on our property. She is a wonderful dog and I will keep you updated on her progress. She certainly keeps Bomber on his toes. 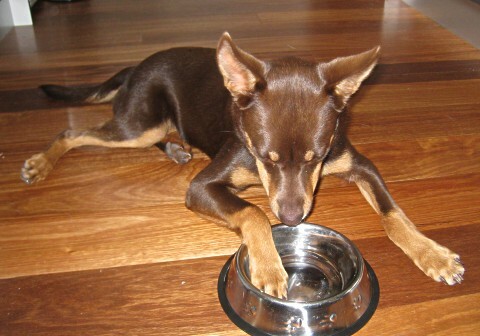 I have attached some photos of our hard working Kelpies. They definitely earn their keep around the property by keeping the beds warm. 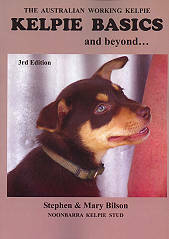 For working dogs they have quite easily converted to house dogs with little interest of looked over the property. Not too sure if either of them would volunteer to go and move the stock with you on a cold wet day. Lucky we only have two horses to bring in and they are well trained with no dogs needed. Other than the winter chills both dogs are doing well and maturing nicely. 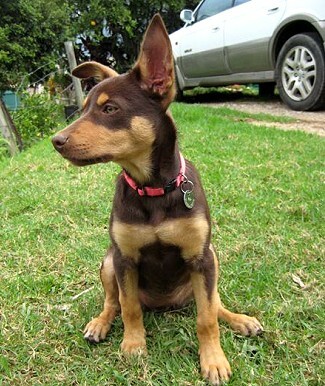 Eleanor is definitely my dog as she will pick and choose when she wants to listen to Nathan. In Eleanor’s opinion, Nathan is not above her in the pecking order although Nathan certainly has a different belief. 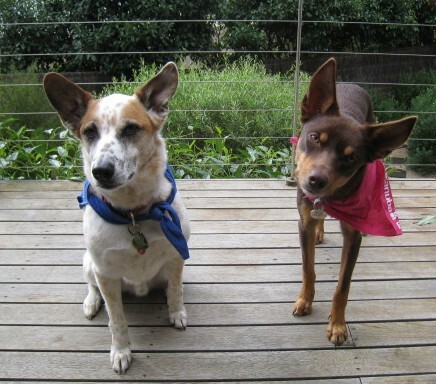 Although both dogs are completely different in personality they are the best of mates. Eleanor is top dog and Bomber knows it. All I can say is thank god we have two otherwise the property would be a mess. Between the two of them they manage to exert most of their energy in chasing each other and the rest is spent on walks, runs and horse rides. 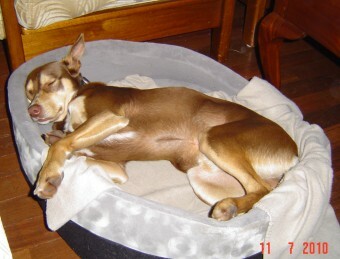 In all the dogs are both in excellent condition and certainly not overworked. Hello!! Dev arrived safe and sound today. She is beautiful!! She was pretty exhausted when she arrived but full of energy this arvo. She has gone for a run around the farm and is a bit scared of the pigs, but did manage a brave BOO WOOOWOO. She picked out a toy and is running around with it happy. Anyways better dash. Will tell you how she is travelling in a couple days. Lucy is doing really well and absolutely adores my other dog Max. who is nearly 18 months but last week when we visited again she was just transfixed. I think she thought he must be a little lamb. She is going to make a very good baby sitter. It has been some time since I wrote to you, thought you may like to know how Lucy is progressing. In January we started a 12 week obedience class, which taught us the basics. She won a ribbon for 'Most Improved" . She would not focus instead enjoying the sights and movement of birds, cars etc. In the finish she learnt to multi -task. 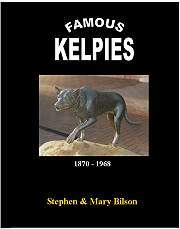 their kelpies from last year.Unfortunately Keith was not there as wanted to show him Lucy. 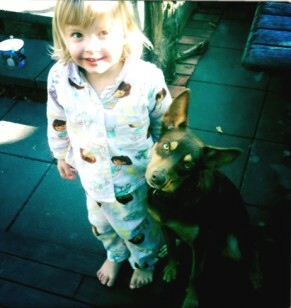 Lucy and I went down early for the Poets Breakfast and it wasn't long before we were chatting to another kelpie owner. Lucy was 1 year old in June and we have come a long way. but we still have a long way to go. I went to see Cesar Millan which was great inspiration. So each morning we are practicing Mastering the Walk --- I didn’t realise there was so much in a walk, if done properly (bonding and trust). Her heel work is coming along in leaps and bounds. 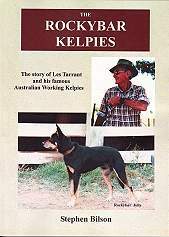 Your Kelpie Book is like the bible for me. I have read and reread it and refer back to it all the time. 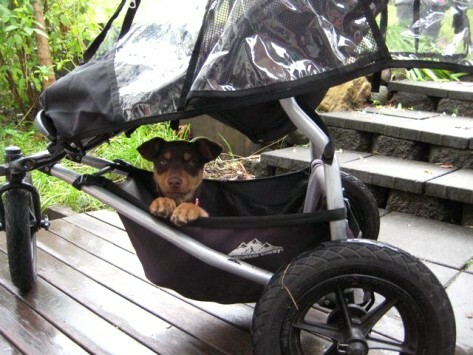 You mention around this age, that she could get the barks. Here's hoping this is a phase she is going through. Sorry we never got to you for Lucy to round up some sheep while she was still very young. So we are going to do the next best thing. 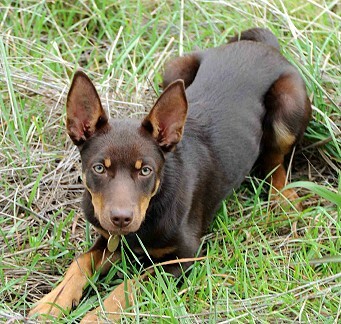 A kelpie breeder in Welshpool, Victoria, Paul McPhail has weekends for City Slicker Dogs. So we are going herding in September. Will let you know how it all goes. When you next update your customer base, would be very happy for you to include Lucy.